Ever since Norm Pace and his colleagues began to discover new life forms from mixtures of environmental DNA sequences in the mid-1990s , the field of metagenomics has enabled the discovery of large amounts of uncultivable microbial “dark matter”, that has vastly expanded our view of the tree of life. Led by Dr. Sarah Highlander, Ph.D., our team at the J. Craig Venter Institute (JCVI) in La Jolla, CA, had the mission of chasing dark matter that could be pathogenic to humans. Sarah is now the director of the Clinical Microbiome Services Center at Translational Genomics North in Flagstaff, Arizona, and I am a postdoctoral scholar in the laboratory of Dr. Rob Knight, Ph.D. at the Department of Pediatrics, University of California, San Diego. Figure 1. 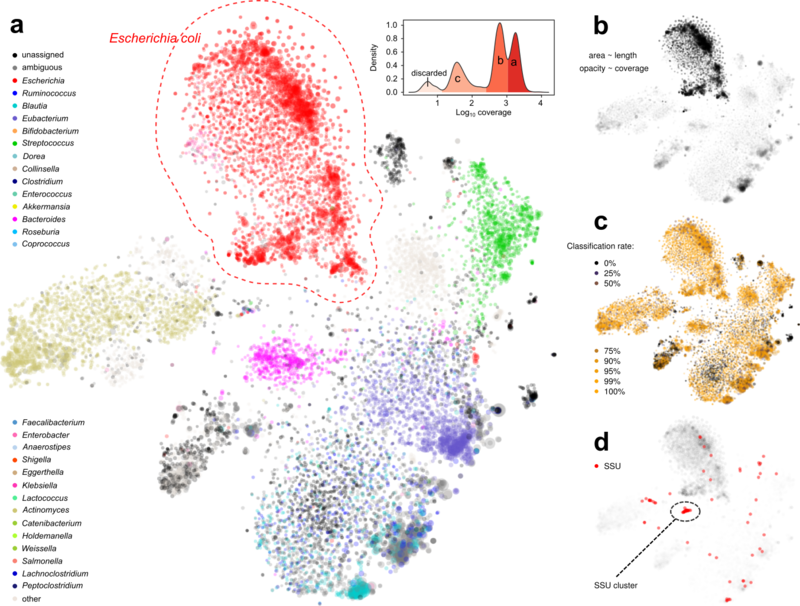 Our visualization-assisted metagenome binning workflow. We studied traveler’s diarrhea (TD), a disease that is extremely common among international visitors who travel to developing nations. We already knew many of the pathogens that can cause diarrhea, such as enterotoxigenic and enteroaggregative Escherichia coli (ETEC and EAEC), norovirus (NoV), plus a few others. But things got challenging in another 40% of patients who are pathogen-negative in their lab report. We knew that a bacterium was there, because antibiotic treatment usually worked, but we couldn’t always know what the pathogen was. Those cases were exactly what we were interested in studying. The pathogenic profile of TD patients is likely polymicrobial. Depending on where one travels and what one eats, drinks, and touches, there are multiple opportunities for bugs to enter the body. Our mission was to single them out using sequencing of complete gut metagenomes, using a process referred to as “binning”. There are multiple automatic binners available. We tested a few popular ones, and were surprised (and disappointed) to find that the results shared low congruence. A more systematic comparison can be found in Sczyrba, et al. , which delivers a similar message, especially when the microbial community is complex. In our particular case, two more challenges added to the difficulty: 1) we cared about pathogenic potential, which are usually associated with mobile elements and difficult to associate with their host genome; 2) we couldn’t utilize differential coverage for binning , since every sample was unique. Figure 2. Display of a metagenome assembly and multiple aspects. Each dot represents a contig. a. Coloring by taxonomic assignment. The red circle surrounds a mixture of several E. coli strains, which were further separated by the coverage map (inset). b. Opacity by coverage. b. Brightness by classification rate. d. Mapping SSU rRNA gene(s). Facing the limitation of facilitating algorithms, we decided to use the “dump” method: that is we eyeballed assemblies and handpicked contigs (Figs. 1 and 2). Sounds like this was tedious and not fun. Yet, as we immersed ourselves into the clouds of contigs, we realized that this was one of the few reliable ways of capturing genomes, because we “saw” them and became convinced that they were there. We were inspired by VizBin , which renders cool scatter plots based on the dimension reduction of k-mer signatures of contigs, and allows the user to draw polygons on the screen to select contigs. We also wanted more information displayed side-by-side (Fig. 2b, c, d) so that we could make better decisions about the validity of a contig clusters. Therefore, we developed our own computational + manual workflow for this task. Under such a fine-grained microscopic view we were excited to find new patterns. For example, we were able to separate closely-related strains of E. coli, a normal and common component of the gut microbiota and also a potential pathogenic invader, by examining the coverage distribution and functional annotation of contigs. This permitted us to separate and assemble individual E. coli strains within a single metagenomic sample. More interestingly, in one sample we separated two blobs of contigs that seem to be related to TM7, a classical “dark matter” bacterial phylum . One mapped to the known oral strain TM7x and this genome was found in several other samples in our cohort (Fig. 3a). The other was “darker” (i.e., more distant from any known species). Further phylogenomic analysis suggested that it was distant from TM7x, but more similar to a strain originally found in wastewater . This now led to plausible explanations regarding this subject during their international trip. Figure 3. a. separation of a novel TM7 strain (a) from a known one (b). b. Discovery of multiple novel phage genomes related to crAssphage. Another interesting finding that was only enabled by gazing at graphs, was that multiple samples shared a pattern that multiple, spatially (meaning k-mer signature-wise) proximal contigs with similar sizes. Most of them were single, circular contigs (Fig. 3b). Within each sample, one of them could be perfectly mapped to crAssphage, a 97-kbp, highly abundant bacteriophage that was discovered from human gut microbiome sequences several years ago , and was isolated only very recently . The others remained “dark”, without any detectable sequence homology to other organisms, including crAssphage. However, the visual information clearly suggested that there is big family of related viral particles dwelling in our guts. Our findings, together with a recent study , significantly expanded this mysterious viral diversity. This work revealed that in many subjects, multiple pathogenic strains were present. Most of them were E. coli strains, but dark matter genomes, some with putative pathogen genes, were also identified. These would not have been identified by traditional read mapping methods, which speaks to the power of binning. Zhu, Qiyun, Christopher L. Dupont, Marcus B. Jones, Kevin M. Pham, Zhi-Dong Jiang, Herbert L. DuPont and Sarah K. Highlander. Visualization-assisted binning of metagenome assemblies reveals potential new pathogenic profiles in idiopathic travelers’ diarrhea. Microbiome 6, 201 (2018). Barns SM, et al. Perspectives on archaeal diversity, thermophily and monophyly from environmental rRNA sequences. Proc Natl Acad Sci U S A 93, 9188-93 (1996). Sczyrba A, et al. 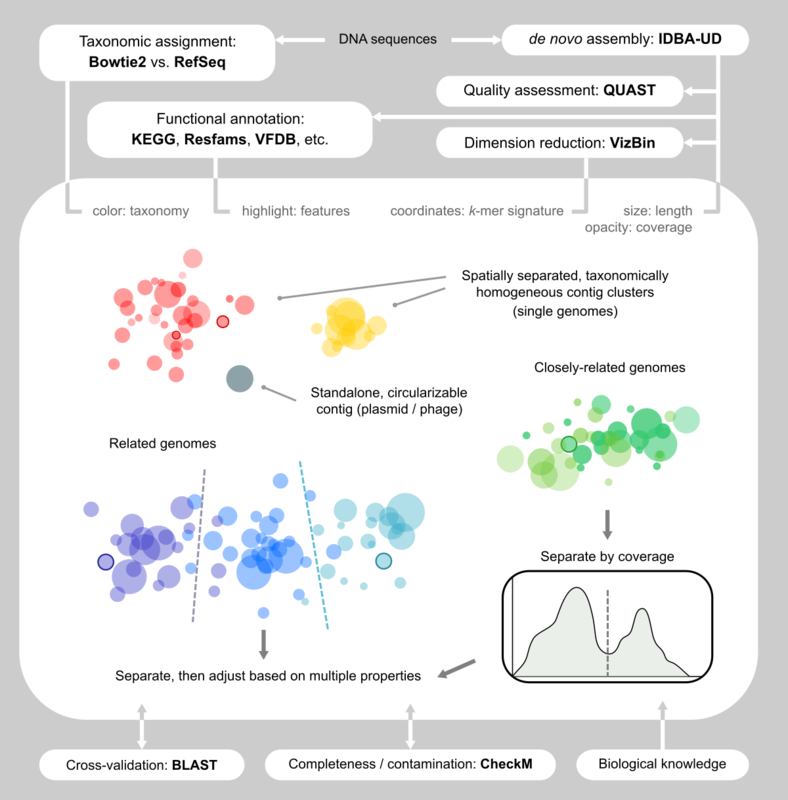 Critical assessment of metagenome interpretation—a benchmark of metagenomics software. Nat Methods 14, 1063-71 (2017). Albertsen M, et al. Genome sequences of rare, uncultured bacteria obtained by differential coverage binning of multiple metagenomes. Nat Biotechnol 31, 533-8 (2013). Laczny CC, et al. VizBin - an application for reference-independent visualization and human-augmented binning of metagenomic data. Microbiome 3, 1 (2015). He X, et al. Cultivation of a human-associated TM7 phylotype reveals a reduced genome and epibiotic parasitic lifestyle. Proc Natl Acad Sci U S A 112, 244-9 (2015). Dutilh BE, et al. A highly abundant bacteriophage discovered in the unknown sequences of human faecal metagenomes. Nat Commun 5, 4498 (2014). Shkoporov AN, et al. ΦCrAss001 represents the most abundant bacteriophage family in the human gut and infects Bacteroides intestinalis. Nat Commun 9, 4781 (2018). Yutin N, et al. Discovery of an expansive bacteriophage family that includes the most abundant viruses from the human gut. Nat Microbiol 3, 38–46 (2018).